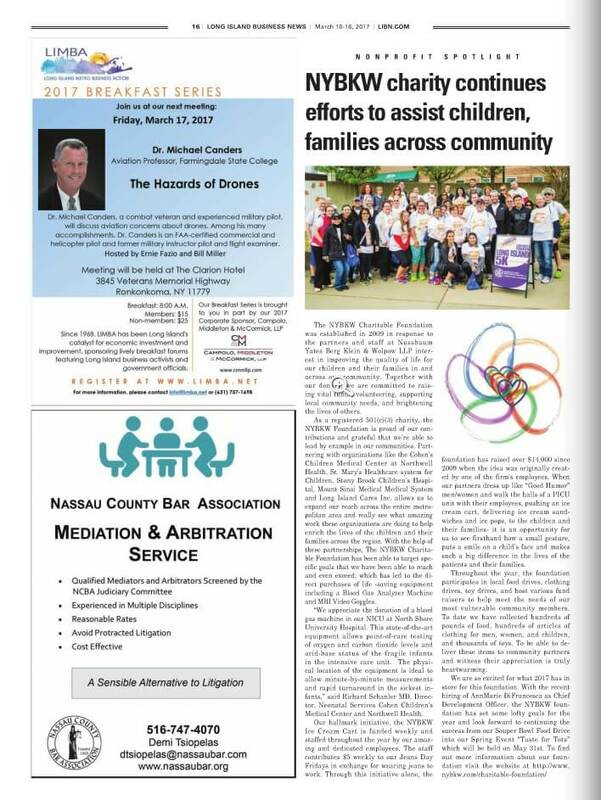 Partner Dennis Klein talks with Newsday about when it makes sense to ask for help. Tastes for Tots was an amazing fundraising event that took place on Wednesday, May 31, 2017, at Appliance World in Huntington. Our guests enjoyed an evening filled with exciting cooking demonstrations, delicious food, beer and wine tastings, magic, raffles, and a silent auction. With the help of nearly 200 guests, over $75,000 was raised to help our community’s children. Heartfelt thanks go out to all our generous sponsors and supporters who helped make the evening a success. This money will be used to impact the lives of children and families hospitalized at local hospitals. The NYBKW Charitable Foundation was established in 2009 in response to the partners and staff at Nusbaum Yates Berg Klein & Wolpow LLP interest in improving the quality of life for our children and their families in and across our community. Together with our donations, we are committed to raising vital funds, volunteering, supporting local community needs, and brightening the lives of others.